Well this hurts. I wanted to love this book so much. I adore Alison Bechdel. She’s incredibly smart, witty, analytical, and heartbreakingly honest–all qualities that have made Fun Home, her first foray into graphic memoir, a modern classic. It’s one of my favorite books, not to mention one of my most frequently recommended titles. Fun Home, if you’ll indulge me for a moment, is the story of Bechdel’s relationship with her father and her coming out process. Her father was many things: an English teacher, a funeral home director, an antique collector, a vigilant restorer of their family home, and a closet homosexual. Bechdel strongly suspects that his sudden, mysterious death after walking in front of an oncoming truck was suicide. He could be distant, demanding, temperamental, and cold to his family. Writing Fun Home was (I imagine) like a therapy session for Bechdel, who hadn’t come to terms with what it was like to grow up in the cold, dark household her father created, and who wanted to understand why her father made the decision to hide his sexuality. It works in large part because there’s automatic tension between Bechdel and her father: he being emotionally distant and firmly closeted, she sensitive and determined to live her life out in the open. The emotional journey she undergoes in the process of writing it all out is cathartic–revelatory, poignant, and beautiful. This is not the case with Are You My Mother? It has been said that the unexamined life is not worth living. Bechdel goes to the opposite extreme as she turns her focus to the relationship she has with her mother, who is still alive and is (understandably) conflicted about Bechdel’s public airing of the family laundry. But instead of the tense narrative of Home, Mother reads more like a grad student’s psychology paper. We follow her to countless therapy sessions and are subjected to passage upon passage from the works of Donald Winnicott, a celebrated psychoanalyst who was influential in the fields of object relation theory and the concept of the “good-enough mother,” as well as Alice Miller’s The Drama of the Gifted Child. The relentless introspection feels masturbatory. The problem is that all this rigorous attention to detail has the opposite effect: instead of revealing, it obfuscates. There’s meat to this story that we never get to savor. Bechdel implies that her mother favored her sons over her only daughter, and her mother agrees, but we never see an example of this. Her mother abruptly stopped kissing her goodnight when she was seven years old, but this highly traumatic event (“I felt almost as if she’d slapped me”) is only really used as an anecdote. Bechdel makes a passing remark that when she went off to college she and her mother “hadn’t touched in years,” but nothing more is said about the matter. Instead, we get a lengthy explanation of how she wasn’t breastfed because, despite efforts, she wasn’t getting enough nourishment from her mother’s breastmilk. This is treated like a revelation: the catalyst of a relationship defined by disappointment and a lack of intimacy. Even if it’s true, Bechdel seems oblivious to the fact that countless people who aren’t breastfed grow up to be perfectly fine. My mother was unable to breastfeed any of her children, yet we all grew up to have healthy relationships (despite the stormy marriage our parents had). I know, I’m simplifying the point Bechdel is trying to make, but I think it serves as a perfect example of how her intense scrutiny gets in the way of actual revelation. There’s also a distressing amount of dream analysis–a very Freudian concept to be sure, but also the most specious form of self-introspection in existence for someone as obsessive as Bechdel. In one of Are You My Mother‘s worst moments, Bechdel dreams that her therapist takes a torn pair of her pants to sew a patch on them. This is also treated as a major revelation. “You were gonna fix the tear, which maybe means tear, too! You’re healing me!” Bechdel exclaims to her therapist in their next session. 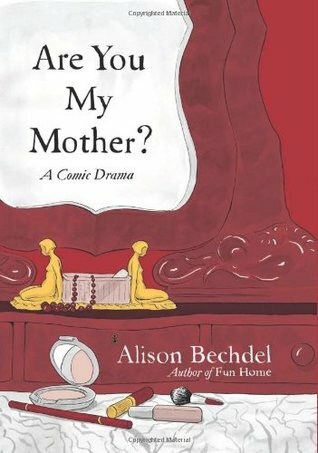 Throughout, Bechdel’s mother remains an enigma–a shadowy figure lurking on the periphery of a book ostensibly about her. There isn’t anything to love about her as presented here, but there isn’t anything to loathe either. Toward the end we discover that the mother may have perpetuated the same crimes of ambivalence and distance that were committed against her as a child and as a wife, but this all-too-brief moment is the closest we come to any actual understanding. More than anything, she seems to be a prism for other, deeper hurts. Perhaps this book isn’t so much about Bechdel’s mother as it is about Bechdel’s constant quest to find the acceptance she didn’t get as a child and to locate a proper (good-enough?) mother figure. She certainly becomes dependent on each of her successive therapists for affirmation, desperately clinging to them as maternal figures. Bechdel even professes to have come to realize that whatever it was she wanted from her mother, she wasn’t going to get it. It would also explain why she selected the title of P.D. Eastman’s classic childrens book when naming her new memoir. Even if that is the point, it doesn’t make for a good read. Bechdel’s dogged reasoning obscures far more than it reveals. It’s like when you stare at something for so long that its shape begins to lose focus and all meaning is lost. There were many times in Are You My Mother? that I wanted nothing more than to give Bechdel a good, long hug and tell her that she should try letting herself off the hook every now and then. It must be impossible to enjoy life when you spend every waking minute worriedly questioning everything. Certainly it must feel exhausting. For more LGBT books, check out my LGBT book recommendations page.